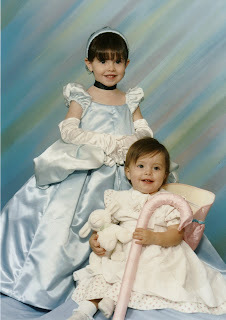 In 2002 my oldest daughter (now nearly 10) was in LOVE with Cinderella. For Halloween that year she requested to be Cinderella and I went looking for a dress. Every store had a Cinderella dress but none of them were what I wanted. They were all cheap looking and cost more than what I wanted to spend on a dress that was going to fall apart. I had a little bit of experience with sewing so I found a pattern, bought fabric and went to it. It was hard, frustrating, and I even bled on it a little bit when I stabbed myself with a pin. The dress took forever to finish but was done for the big day and she looked marvelous! I learned a lot about sewing from that dress and I learned a lot about my own capabilities as well. I really could make something that was amazing, something people ohhed and ahhed over as she walked by. I was hooked. From Halloween costumes I moved on to dresses and other dress up clothes. When my girls (now 9, 8 & 5) had birthday parties I made a dress, or outfit to coordinate with the theme. I was soon making a vast majority of their church dresses and I happened to catch the eye of a girl who had a Princess business and was working with a local production company. She asked if I made my children's dresses and when I answered yes her eyes lit up! Sandra had me working first on the community theater productions and then once her business expanded she had me working on princess dresses as well. After a year and a half her princess business was becoming more full time and I bought the costume business from her - Once Upon A Costume was mine!! The last 3 years have flown by and I really enjoy what I do. New ideas and challenges keep my job interesting there are very few projects I won't take on. My girls are very well versed in most things fabrics and trims and are known by name in several fabric stores around Vegas. I love being able to create pieces that will bring smiles to children all over the world. Children's clothes is a new area I'm just getting into and it's already something I like a lot! Here are links to some of the projects I've done in the past. Christmas Dresses, Every day, Baptism & Blessing, Dress up here and here, Flower Girls, Halloween here and here, Easter dresses here and here, Pj's and Special Occasion. This dress shipped out to NJ on Tuesday and will make it's debut this weekend. I definitly earned my money on this one. It was much harder to redraft the off the shoulder pattern to on the shoulder than I expected. The when it all went together it was 4 inches too big! After three tries it was finally the right size. Then I noticed as I attached the sleeve to the bodice that the trim was different! I bought the trim with the same SKU # but it had been changed at the original company. I checked all 3 of the stores in my area and they all had the "wrong" trim so I finished the dress off with it and don't think it will be noticeable. Unfortunately I can't control what stores carry or what manufacturing plants produce. I will always do whatever I can to make every dress look it's possible best! The first project this year was a few replacement pieces. The Cinderella was worn out at the seams and she wanted big poofy sleeves. I lined them with netting so they hold this shape all on their own! Snow White was unfortunatly ruined when red polish spilt on it! To give these sleeves their shape I lined them with netting and added an interfacing header.